Choose 2.5 x 5.5 connector. The only safety product cyclists can’t wait to use. Please join our mailing list to be notified when we launch the new and improved Down Low Glow. We have suspended sales of the Down Low Glow V1, to focus on getting DLG v2.0 ready to roll! We guarantee it will be worth the wait! Thanks for your patience, and please read on to find out more about our favorite safety product. In the meantime, please check the other bike lights that we sell in our online store. 1/15/2014: Rideable prototypes have been approved, and we are early in the process of designing the plastic enclosure. Rock The Bike’s circuit wizard has finalized the two long circuit boards that will be in the new Down Low Glow! The three large rectangles in the top board are Lithium-Ion batteries, a major step up from the Nickel Metal Hydride batteries in our Down Low Glow V1. The bottom board has power management circuitry that can take a charge from nearly any wall adapter, not just the one we will be including. 4/1/2012: Check out the video below to see the latest circuit breakthrough on the Down Low Glow: wide voltage range, same brightness. And a cool new Low Battery alert is shown at the end. Rolling with friends on a moonlit cruise. Clearing your head with the cool night air. Taking a special someone out on the town. Getting your heart beating on your way home from work. With six beautiful colors to choose from, the Down Low Glow is a premium-quality, one-of-a-kind product, featuring a lightweight rechargeable battery, easy mounting kit, shockproof light tubes, and picture-book owner’s manual. The whole system weighs in just over a pound. It won’t slow you down, but it will enhance your safety. Check out all the features of this amazing bike light. Derek Pearson customizes a chopper with the Down Low Glow. Rolling with the DLG is also extremely cool. People often say it reminds them of the neon lights on Lowrider cars. But really, it’s much better, because you don’t have to lean out the window to enjoy the effect. The DLG throws a cloud of neon light on the ground up to 10 feet in all directions (depending on the level of street lighting). With the DLG, you can start organizing cruiser rides and social rides in your city or town. To a concert, to a field to watch a meteor shower, to the café, or to your friend’s house. On the way there, you’ll hear people shouting “Nice bike!” and “Your bike is tight!” It’ll feel good knowing that you’re changing the way people think about bikes, just by rolling by. When you read about how the Down Low Glow was invented, you’ll know it’s perfect for cruiser rides, social rides, and music cruises. The Down Low Glow is the only bicycle safety light with GSR (“Gimme Some Room”) Technology. The whole point of GSR technology is to make you and your bike seem wider on the road than you actually are. GSR technology helps make it clear to drivers what part of the road is yours, and what part of the road is theirs. So when cars pass you, they are likely to give you more breathing room. “Cars make a very wide pass around us at night 🙂 Since we went crazy on lights, there’s never even been a close call, a lot of cars will actually give us the full car lane on 2 way streets if there’s nothing coming the other way…” — Derek Pearson, Corvalis, OR. Did you know that nearly 70% of all nighttime bicycle-car collisions are due to side visibility? Most LED-based safety lights aim forward or backward. The Down Low Glow provides superior side visibility to blinkies alone. Installation is easy, requires no tools or zip ties, and is not permanent. The DLG fits bikes of all types and sizes from racing bikes to 20″ BMX, to recumbents. It takes about 5-10 minutes to put the Down Low Glow on your bike for the first time. When you get good, you’ll get it down under a minute or two. For the single tube version of the Down Low Glow, installation times are about 50% lower. Either way. you’ll be out rolling on a cloud of colored neon light the same night you receive your order. See loads more photos of the Down Low Glow on our Flickr account. GSR Technology -Gimme Some Room! GSR (Gimme Some Room) Technology. Funny name, but it really works. GSR technology refers to the erie bands of light jetting out to the sides of your bicycle, extending well into a full lane of traffic even under street lights. This helps you show drivers visually what part of the road is yours, and what part of the road is theirs. No other safety light communicates a boundary like the Down Low Glow. We can obviously make no guarantees as to the behavior of drivers, but it’s been our experience that they really respond favorably to the Down Low Glow. They simply give more room, more often, when passing from the rear. The effect is tremendous when the DLG is paired with a rear blinky. Basically, the light from the blinky hits the driver from far away, maybe a quarter mile, with its focused, directional LEDs. If you’ve got a decent blinky, then by this point the driver is probably already aware that there’s a bike ahead. 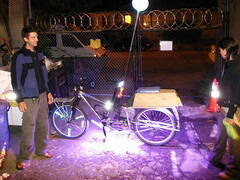 Then, as soon as they get within a few hundred feet of your bike, an unusual stripe of bright colored light appears. It catches their attention. And it’s at this point that most drivers, in our experience, slow down and yield more space. “Let’s talk about the GSR Technology…I was not crowded once by a vehicle on Market St. yesterday. Not once! Now it could be a very strange coincidence . But not likely, I don’t think I’ve ever experienced that on Market during commute time in my lifetime. I am very happy and can’t wait to go ride some more at night.” — Josh from San Francisco. — Ian from Upstate NY. GSR Technology goes hand in hand with the amazing side visibility the Down Low Glow provides. Side Visibility is what helps you be seen sooner in rare, close-quarters emergency situations, typically happening at or near intersections, when an extra quarter-second of a driver’s attention really counts. GSR Technology is what covers you in non-emergency situations. These are the situations where, if you normally use blinkies, you probably would have been plenty safe without the Down Low Glow. But just because these situations don’t threaten your life doesn’t mean they can’t be improved. Ask yourself, if there were a bike light that based on anecdotal evidence alone, is likely to increase the average distance cars give me at night, wouldn’t I want to at least try it? Getting passed from the rear by a car is probably, statistically speaking, your number one fear. That is, the majority of bike riders fear getting hit from behind the most of out all road situations. So why not make that experience a little less nervewracking. The Down Low Glow appears, from our experience and that of the customers quoted in our testimonials, to grab the attention of drivers in a new way, a way that leads them to yield more of the lane, and hopefully the complete lane, to you. These moments, these non-life-threatening moments, including getting passed from the rear, probably happen dozens of times to you in a single night ride. As so, you’d probably notice even a modest improvement in your coolness, calmness, and collectedness as these moments occur. And GSR Technology will make a big difference in you feeling that way. Enjoy the relaxed ride you’ll get from GSR Technology, one of the unique benefits of the Down Low Glow. Single Tube DLG Systems: cool, safe, and simple! Great for kids and commuters. When you want to experience Cool Safety in it’s simplest form, you’ll want to pick up a Single Tube DLG system. Single tube systems look great, are easy to install, and have long battery life when compared to our dual tube systems (5-6 hours versus 3 hours). If you’re the type of person who likes to move lights from one bike to another, or take them off your bike because you’re concerned about theft, you’ll like the fact that the single tube system has fewer parts to keep track of. Single versus Dual. One might quickly conclude that the Single tube system is half as bright because it has half as many light tubes. But consider the position and the angle of the light tube. The single tube system, mounted on the down tube of your bicycle, hits the side angles so that when you’re in an intersection, cars entering from different streets can see you. When you look down to catch your own aura as you ride, the light from that forward mounted light tube stretches to the edges of your peripheral vision. As the rider, you won’t perceive the Dual Tube system to be twice as bright as the Single. So if you’re looking for a great gift for a kid, bicycle commuter, or anyone who’s got enough things to worry about already, get them a Single Tube system. If on the other hand, you’re looking to take the street glow to the max and create an all-out party mode for your bike, you’ll be more psyched about our dual-tube systems. Maximize your visibility and the curbside appeal of your two-wheeled thing. The Dual Tube DLG systems give you the most possible light and help you pull in more “Cool Bike!” shout outs than any other bike light. With one shockproof light tube under your front triangle (down tube) and one under the rear (left chainstay), you’ll be cruising on a full carpet of neon light. The dual tube system provides almost three hours of bright light on a fully-charged battery. To extend this time, you can carry a spare battery, get the double-wide extended life battery or go with the Single Tube system instead. A lot of people ask us if the DLG is suitable for the type of hard city riding they do. Fortunately, our patent-pending shockproofing technique that protects the superbright lamp from breaking inside its housing. You can ride offroad, down stairs, off curbs. Just ride how you normally ride. The Down Low Glow is also made with a shatterproof exterior housing similar to the material used in bulletproof glass. Rocks and parking meters won’t break it. So relax, and ride. Check the video below for more on shockproofing. Just because you’ve decided to stay safe and stylish when you commute by bike doesn’t mean you want to load your rig down with extra weight. The kid inside you still enjoys edging out that spandex-clad racer to the last gleamings of a yellow light. You love tight turns and fast descents and you don’t want your bike to slow you down. Luckily, the Down Low Glow only adds a little over a pound to your bike. You can still lift it up on your shoulder for the flight of stairs to the subway, and you won’t notice the difference in your cruising speed. Sure, some people pay hundreds of dollars to shave a couple ounces off their wheels, but weight on your wheels and weight on your frame are totally different due to a physics phenomenon called rotational mass. Adding a pound to your frame is hardly noticeable. So rest assured that adding the amazing visibility and cool safety of the Down Low Glow to your bike won’t slow you down. Keep your bike svelte and safe with the Down Low Glow. Many bike lights need to be installed with a screwdriver or a wrench. The Down Low Glow has a secure, shockproof mounting system that requires no tools to install. Just stretch the rubber straps around your frame and pop the DLG’s light tube into the plastic clip. We searched long and hard at industrial trade shows to find a clip that was easy to use, durable, and sleek. As you can see from the photo above, it doesn’t interfere with the brake and shifter cables on your bicyle. For our dual tube systems, there’s are a couple velcro cinch straps to tighten in addition to this clip. We could have used zip ties in our mounting system. But zip ties are a single use product. So you’d need more of them if you ever want to move the Down Low Glow to another bike. A lot of our customers have more than one bike and want to move their lights from bike to bike depending on who they’re with, how far their going. On one night, I might take the cruiser. On another night, I might need to carry something, so I take the Xtracycle. If I’m leading a social ride, I’ll take the Soul Cycle. Our no-tools mounting kit makes it easy to have fun with your entire bike fleet, and loan your Down Low Glow lights to friends, too. If you’re the bike guy or gal in your family or circle of friends, the Down Low Glow will help you pull people in to the social biking experience. They’ll see that biking is the perfect way to relax and get the night started. And with the Down Low Glow, you’ll be keeping them safe as you cruise the city or the neighborhood. Many less experienced bikers worry about safety around sunset and after dark. And rightfully so. 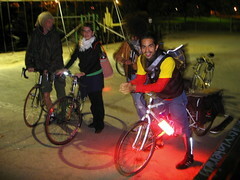 But with the Down Low Glow, you can calm their fears and show them the fun, social side of biking. Before you know, people will be gathering at your place on Friday night, wanting to cruise on the bikes in your garage. Our single tube DLG systems are a great way to go if you’re interested in hosting social rides. They’re easy to install and move from one bike to another, and they’re our least expensive DLG systems, so you can buy a couple and have one ready for a friend to join you on your next cruise. Mix the colors to get beautiful color fades happening under your bikes as you ride. The Down Low Glow’s light tubes are lightweight, sleek, and very futuristic, with their chrome reflectors and end caps. They are shockproof, low profile, and water resistant(10 out of 10 recently passed a dunk test). They weigh next to nothing, as nearly all of the weight in the Down Low Glow system is in the 1lb battery pack. Most of our customers choose to leave them on the bike all the time. 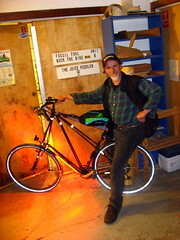 Derek from Olympia, Washington is doing it ( www.bikerubbish.com ) . Racer Rolf Hebenstreit from Northern Idaho is doing it. Jeff Youngstrom will probably be doing it next time it snows in Issaquah, Washington, now that his Down Low Glow has arrived. Mary Arnesson will be doing it in Minneapolis this winter, given her penchant for riding all year round. If you’re the type of rider who heads out in the snow, we want to be right there with you. “The snow reflects the DLG lights nicely.” — Mary Arneson. “Hey Paul, They’re awesome on the snow!! Cars slow down a block before they get to me! They must think I’m a “UFO” !!! I ride to work almost every day from -2 degrees to about 15 degrees in the morning. “DLG” & Nokian studded snow tires ROCK! The extra waterproofing is doing the job nicely. Thank you again for a great product and great service. Over the bars….. Rolf. — Rolf Hebenstreit, master-class mountain bike racer, all-season commuter. From 2004. The ‘extra waterproofing’ Rolf talked about is now standard on all Down Low Glow systems. Jeff riding home from work in the snow. That’s the spirit! Once you get past your initial hangups about gettng wet, riding in the rain and snow can make you feel so alive! You’re out there, flakes hitting your face, landing on your hands, odd sounds coming from your tires as they get caked. Sure, you probably wouldn’t want to do it every day this winter, but you probably won’t have to. The few cars that are out there with you in the snow will need to see you. So in addition to adding a UFO look to your rig, the DLG will be creating a wider buffer space between you and drivers. They’ll be more likely to slow down sooner and cut you a wide berth than with blinkies alone. We put a lot of thought into the new manual, so that you wouldn’t have to. The pen and ink drawings include only the information you need to quickly and securely install the Down Low Glow on your bike. If you would like a copy of the Owner’s Manual, please email us and we can email it back to you. We will also try to get it up on this sight for download soon. Illustrator Nathan Welch first met the Rock the Bike crew while visiting the bay in 2006. Now rolling with the DLG in D.C., he teaches drawing, and loves to ride his bike and his Vespa. Click here to view and download the manual. If you’re like many Rock the Bike readers and community members, you crave the Side Visibility the Down Low Glow provides, but you already have a handful of devices you need to remember to charge up regularly — your cell phone, digital camera, and MP3 player, to name a few. The longer these devices last between charges, the more the benefits of using them outweigh the hassle of having to remember to recharge them. And with 25% longer battery life, the Down Low Glow just took a big step in the right direction. By working closely with our suppliers of rechargeable batteries and CFL lamps, we’ve increased the capacity of our batteries without increasing their size or weight, and reduced the power consumption of our light tubes without decreasing their brightness. Here are the numbers from recent testing with a fully charged, standard DLG battery. The Moment of Recognition (MOR) is the moment when two bicyclists, heading the opposite direction, have a clear view of each other and either wave, nod, ring a bell, recognize each other as friends, or simply pass each other. MOR often takes place at a 45 degree angle. This is also the angle when your Down Low Glow lights are at their brightest, which means that people passing you will see you and your bike in its most eye-catching state. It’s a little thing but it makes daily life as a cyclist more fun. People who know you are more likely to shout your name and pass you with a smile. People who don’t know you will appreciate that you’re out there making a positive statement about bikes. Bring the Beat, Bring the Light. Rock the Bike. Above, Rock The Bike’s piece on the benefits of Side Visibility. Above, a YouTube video by Livewombat, an enthusiastic customer, shows how bright the DLG is when viewed from the side. Front and rear safety lights (blinkies) protect you well in many riding situations. But blinkies are weakest when viewed from the side. Unfortunately, side visibility is the most common cause of nighttime bicycle-car collisions. Every time you approach a turn or an intersection, your side visibility is key to drivers seeing you. Bike commuting, early morning training, and sunset rides should be inspiring, relaxing, fun and invigorating. And they can be, when you take the right safety measures. To feel relaxed and confident at those intersections, you need to know that drivers from all angles, especially the sides, can see you as early as possible. Most cyclists don’t realize how important side visibility is to their safety at night. It turns out that the majority of nighttime bicycle car collisions, nearly 70%, are related to side visibility. And the Down Low Glow is a better source of side visibility than any other bike light on the market, making it a smart choice for your visibility. Pair it with front and rear blinkies for the ultimate safety package. You can wait safely for your spot in traffic, then make your turn without rushing, confident that drivers will see you from all directions. Above, a 3D model of an intersection shows different angles from which cars need to see you. See more examples, including some from the New York Times. “My wife got a chance to use it on her way home from work and she absolutely loves it. She felt like she finally got some respect on the road, even having one car come to a complete stop when it saw her. It seems to have inspired her back on her bike again, especially for night riding!! !” — Si from Alabama. Now that you’ve read about how the DLG prevents many nighttime collisions, you’ll want to see how it helps you speak up for your space on the road to drivers approaching from the rear. No problem matching the DLG to your bike. We have six awesome, superbright DLG colors to choose from. But don’t just pick the one that’s closest in hue to your two wheeled thing. Each color has its own mood, its own feeling. They’ll all keep you safe, but each color sends out a different energy. We’ll try to run down the colors to help you choose. Ice Blue: Our most popular color. Very cool, confident, kind of playful. Stealthy. A bit intimidating. Envy Green: Think space aliens landing in UFOs in 1950’s B Movies. The mothership has landed. Some say this is our brightest DLG color, and it certainly pops out against the asphalt jungle. As the name implies, it inspires envy on night rides. Plush Red: Intimate, suave, bold. Think crushed velvet ropes. Plush definitely helps you work it on a bike date. Also extremely eye catching. Fossilized Amber: A rosy tinge and a lot of orange go into our Fossilized Amber. If you’re into sunsets and sunrises, you’ll love this color. Not only is it beautiful, it’s also street legal. Some states have laws prohibiting certain colors on the side of a vehicle, but amber is always allowed. In practical, daily use, police officers do not bother Down Low Glow customers, because they respect bicyclists who take safety seriously. But if you’re the type of cyclist who likes to stick to the letter of the law, you’ll appreciate our Fossilized Amber. And from a safety standpoint, it’s even a hair brighter than our plush red because of its light colored filter. Hot Pants Pink: A superbright color for the pink fanatics out there. Work it girl! Royale Purple: Some people are purple people. And for them, everything must be purple, including their bike lights. Note, this color is a subtle step down in brightness from other DLG colors, because purple is a darker hue than blue and green. So if safety is your primary goal, consider picking another color, or compliment your DLG system with some blinkies. If there's something you find reassuring about having a tailight this powerful, this large, on your long bike or commuter bike, trust your instincts. Get the Down Low Glow. For years we’ve been selling the Down Low Glow as a Side Visibilty and Ground Effects light for bicycles. Some of our customers have been trying it out as rear light, and I finally set it up that way for myself. The results are in. Never has it been this much fun to take the lane. The Down Low Glow makes a killer taillight on any bike with a rear rack. The complete sweep of visibily of the Down Low Glow outdoes anything else on the market, and the bright red light around your bike communicates to drivers what part of the road is theirs and what part of the road is yours. You can rotate the DLG’s light tube so its brightest light hits the eyes of drivers. The DLG is brightest at the extreme angles of its light tube, as you can see by the hard transition to from the Plush Red on the ground near the rear wheel to the Royale Purple from the DLG system mounted on the downtube and chainstay of this Mundo. The other bright band from this rear-mounted tube is the one aiming right at the camera. Stand your bike up near a wall and rotate the light tube until the brightest band of light come up the wall light. Angle it up at eye level of drivers approaching you from the rear in cars and trucks. One last point. I have yet to verify this with an neurobiologist, but anecdotal and visual evidence suggests to me that the Down Low Glow could be an inherently more effective bike light because of its size. My theory is that our brains are wired to think that bigger is more important. Therefore, a point source of light, like a strobe or an ultrabright blinky, even if it gives off as many lumens, can’t catch the eye of drivers like the Down Low Glow. The Down Low Glow has a 1-foot-long, 1-inch wide light tube. My theory is that this longer, wider source of light simply trumps the importance of smaller ones in the brains of drivers. Try the Down Low Glow risk free for 30 days. We look forward to getting you Glowing.